I have a soft spot in my heart for travel books, especially ones that span the globe. This particular story places its characters in various places, from Rome to Seattle, but there's a personal journey these characters find themselves on which ultimately leads this novel to a memorable place inside my literary heart. Lucy and Owen find themselves trapped in an elevator, several stories up in their New York apartment building, during an east coast black out. What should be a frightening nightmare quickly turns into a night the two of them will never forget. They are both two lost souls, wandering through life, in one of the largest cities in the world. Yet they both have never felt so alone before. In the midst of chaos, something magical is born, and these two discover something they hadn't quite known they were looking for. But their new-found friendship, and possibly something more, is pulled apart just as quickly as they were stuck together in that elevator. Lucy is off to Edinburgh to live with her world traveler parents, who have found a place to settle down for the time being. Owen takes to the road with his recently widowed father, in search of something that can't be replaced. Their relationship hangs on by post cards, and emails, and even a random meet-up in San Francisco. Distance creates fractures in this connection they are trying so desperately to hang on to, yet their lives are constantly moving, causing them to create new connections in new places. This novel has a very slow, even pace that stays consistent through out. It does not leave you with cliff hanger endings, causing you to read on until you finish. The tone of this novel is like a soft whisper that you must listen to carefully, or else you might miss its message. But once you open your ears and really allow Lucy and Owen's stories to seep in, it becomes a beautiful melody you never want to end. I learned to appreciate their story, fully connecting with it as everything culminates back where it began. THE GEOGRAPHY OF YOU AND ME takes the reader on a journey, discovering that sometimes its not always about the places we visit, but rather the people who share those journeys with us. I've heard so many mixed feelings about this book that it makes me even more curious to read it. I like your description about it being a whisper...I think that helps set up the expectation for me. Sometimes I just crave books that have a slow, even pace from beginning to end. Pairing that with Jennifer E Smith's writing sounds absolutely divine! Great review! I really enjoyed this book too :) One of my favorite freebies I've read this year! 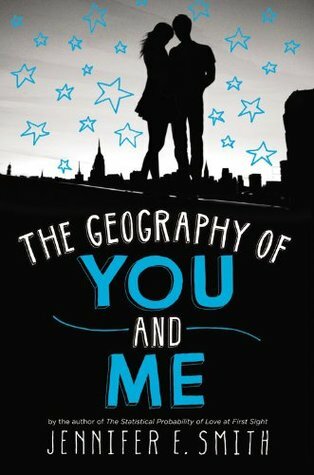 The Geography of You and Me is such a beautifully written book! I enjoyed it a whole lot, especially because it has the same magic that all the Smith novels I've read do. I particularly liked the long-distance, will they-won't they bit to it!